In the last couple of weeks I’ve jumped on the Pinterest bandwagon of making Mason Jar Salads for my lunches (which is kind of funny considering I’ve only been on Pinterest a couple of times in my life). There really are SO many awesome ideas out there though, and I wanted to try to do something to increase the amount of veggies I eat in a day, and this seemed like the perfect solution! It took me quite a bit of prep time that first Sunday because I was measuring and entering everything into MyFitnessPal as I went along, but I can tell it will be exponentially faster each subsequent time that I make them. I tried to get a good mix of carbs/fats/proteins in every salad and stay around the 400 calorie mark. I wasn’t sure how the lettuce would keep, but (non-spoiler alert – you see what I did there? *grin*) my Friday salad was still fresh & delicious 5 days later. Consider me impressed! Using different amounts of ingredients and types of salad dressings will of course change the calorie count pretty quickly on these salads, so make sure you pay attention to that if you’re concerned about calories. It would be easy to make a simple olive oil and vinegar type dressing for most of these salads as well, but I decided to try to use up what was already in my fridge first. I also added chicken to most of my salads because I like chicken, but if you don’t eat meat it would be simple enough to add different nuts, tofu, quinoa, etc. to increase the protein that way. You can of course add other items to these layers – these are just some of MY favorite salad ingredients that I jotted down for quick reference. I used wide mouth quart sized mason jars that I bought at the local hardware store ($11 for a dozen of them) and that makes a really good sized salad. Without further ado – here are the salads I made last week! I made this using leftovers from tacos we ate on Saturday night! I basically used 1/5 of the meat/bean/taco seasoning I made + I portioned out the toppings. I also make this combo as a side salad all the time when we make steaks for dinner – I just omit the chicken. Any apples would work, but I love how tart the honeycrisp apples are! Next time I’ll probably chop my apples into bite-sized pieces so I don’t have to worry about cutting them up as I’m eating at work. I ended up eating out for lunch this day, so I ate my salad for dinner instead since it was already made and I didn’t want it to go waste. Delicious! Y ou can also pour these ingredients into a flour tortilla to make it a wrap for an extra 130 calories = 409 calories total. Most people like olives on this as well – I just can’t stand them so I omitted them! T his is my go-to easy salad that I eat at lunch because we always have the ingredients on hand. It was even easier to have it already made up though! Since it took me awhile to get around to writing this post, I’m also going to add the new salad I tried out this 2nd week that I made while catching up on The Bachelor 🙂 I was off work on Monday and had a crazy day Tuesday, but I was determined to not fall of the wagon of making these that quickly, so I whipped up 3 identical salads for me to eat Wed-Fri this week. Quick & easy! This was a meat-free salad that I made with 3 cheese tortellini that I bought in the refrigerated section at the grocery store. SO good! Next week I want to try to make some salads using quinoa for the protein instead of chicken. I’ll try to keep updating with new “recipes” on here as I put them together. It’s amazing how full you feel on 400 calories when it’s all nutritious foods! For more details about the how and why regarding mason jar salads, check out The Ultimate Mason Jar Salad Tutorial and Recipe Roundup on Organize Yourself Skinny. How about you guys? 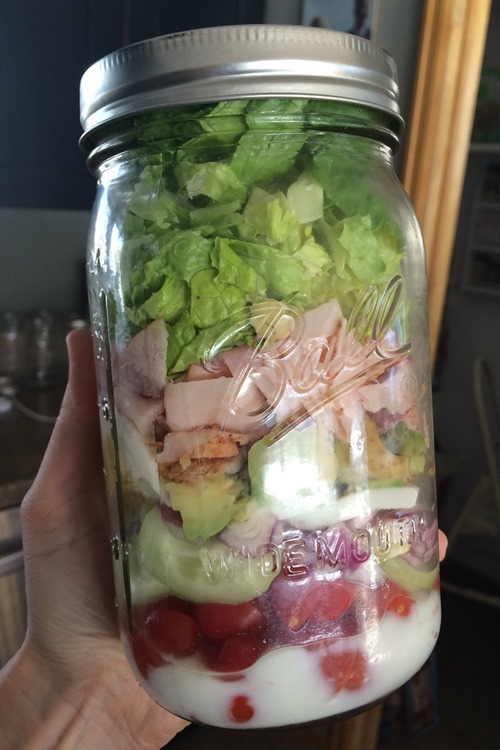 Have any of you made mason jar salads and have a favorite recipe you’d like to share? WANT! Dumb question: where did you get the mason jars? I bought them at the local hardware store. You can get them on Amazon too (that was like $18 instead of $11 for me). I made a fresh mozzarella salad for Hottie and he loved it! I got the recipe off of the ultimate link you shared here. I added chopped up rotisserie chicken, which we like to keep on hand. It was good and he washed out the jar and used it to force down a huge helping of water. He couldn’t get to the second jar this week with his travel schedule, so I’m eating it tomorrow! Haha – I love those bagged salads too, but I also can’t justify buying them unless they’re on sale. Funny you like those and think these look gross! This is awesome and totally overwhelming. I think I’m ready to MFP it up again soon, so this is something I would totally love to do, plus it would be awesome for mark to take to work. i could get him on the bandwagon for Sunday prep. 🙂 he’s always saying he needs to eat better, but he never takes the time to chop and prepare his own food. Plus, if this was or lunch, we could still eat kid friendly dinners and and all eat together a little more carby or heartier at night. Don’t be overwhelmed – it’s actually super easy! Most people just make one or two types per week. Especially if Mark will eat them too, you can make 10 – five of each – and it would be really quick and easy and you’ll each get 2-3 days of each type of salad that week. Even while pregnant it’s an easy, quick lunch if you want (though I couldn’t stand salad while I was pregnant, weird). Yeah for Mason jar salads! I’ve been doing them all this week too, ever since your post from last week. They’re delicious! And you’ve inspired me to be better prepared to make some more interesting recipes, as to date I’ve just done dressing (balsamic or yogurt), tomatoes, cucumbers, cheese and arugula. I really want to try the taco salad and your apple one looks great, although I think I’ll go goat cheese instead of blue, as I’m not a fan of blue… Thanks for bringing these to my attention. A fabulous way to get veggies and greens in! I’ve been looking at doing the overnight oats, but lately I’ve been on a big frittata kick – usually that sweet potato / goat cheese / spinach one I linked to awhile back. So quick & easy in the morning b/c I usually make it the night before! My fritatas are always kinda spongy… I need to work on that. You inspired me with your picture a few days ago so I went and bought 3 mason jars (starting out realistic) and I made one Tuesday and one again today. I’m not as fancy as you – the typical ranch, chicken, cheese, and lettuce with a few raw veggies is what I made, but it was awesome! I told JJ it was nice having the extra veggies that I wouldn’t normally put on a salad if I was in a rush. I even made him one for work today (with the dressing separate b/c he hates veggies – nice, huh) but he forgot it at home. Or ‘forgot it.’ He better take it tomorrow! 🙂 Thanks for sharing all your recipes! Yep, I like that you can make them as fancy or simple as you want. I think I’ll skip the red onion next time b/c I’m just not much of an onion fan, but overall it’s pretty simple to throw a half a dozen ingredients in a jar and put the lid on. I’m loving it! I used onion sprouts and they give a nice, gentle onion flavour without being all ONION up in your area! These look amazing!! I can’t wait to try this! I love doing food prep on weekends for the week. It makes grabbing lunch/dinner SO much easier. Oh – I have made overnight oats also – they are SO good!! I’m seriously obsessed with these now. I used one of the recipes you linked to from your other post and made a quinoa Mediterranean salad for this week. It’s easier for me to buy in bulk and make 5 of the same than to figure out ingredients for 5 different. The quinoa one made me a little nervous b/c it actually tells you to put it on the bottom layer (which is contradictory to the general guidelines) but it turned out great – lots of flavor. Kind of dry dressing-wise though so I might need to double the dressing part next time around. I’m glad to hear you like the tortellini one – I was looking at it and thought I might try it next! I’ve heard both about quinoa – okay to use on bottom, but it soaks up so much dressing can make the rest of the salad dry. I love quinoa though, so definitely trying next week – just maybe in a middle layer? Ive wanted to try this but have been hesitant because I wasnt sure if the salad would really still be fresh days later. Im glad to hear yours was!! Wow. I never heard of this. Good to know. I prepare salad in plastic but never thought about putting the lettuce at the top. I also keep the cherry tomatoes whole so it won’t spoil. You know, that’s one of the recommendations (to leave the tomatoes whole) but i didnt and had no issues with it. I wonder if that was just beginner’s luck?